I'm excited about my feature today! This is one of my favourite stationary / paper goods store. I just love vanessakimball! Check out her holiday special: mix and match cards. Mix and match four cards for $6. It isn't too late ~ you have until December 15... after that, she can't guarantee that you'll get your order before the holidays. This beautiful reindeer card is my favourite. The bright red of the envelope is sure to brighten anyone's day ~ who doesn't love getting something in the mail? This sprightly little guy is red checkers on a lovely white printed paper. Simply stunning. 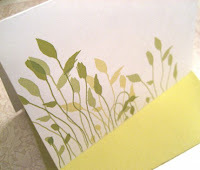 While shopping for cards, check out this pretty green grass one. 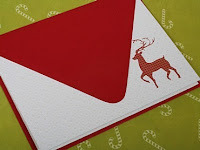 While note technically a holiday card, this simple, versatile design could serve many purposes. I think the best would be just to say hi. Who wouldn't love that? Vanessakimball is a graphic designer for a design company called Ekcetera Productions. 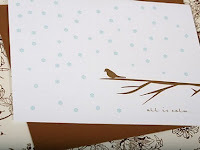 Other than her Etsy shop, you can find her stationary at their new store called Ekcetera, in Inver Grove Heights, MN. You know, if you ever happen to be around the re. Feel free to send her a convo, and ask about custom work if you have anything in mind. You should definitely check out this shop and mark vanessakimball as a favourite so you can go back whenever you might need some paper goods. 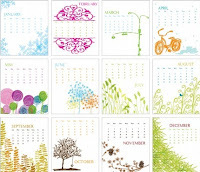 And do check out her blog in support of us 90 day challenge bloggers! Thanks for the feature! A really nice job. You're the best! i love her work, espcially that calrndar, so pretty! !